Description: This experiment is designed to study the heritability of flowering time and to examine the role flowering phenology plays in the reproductive fitness of Echinacea. 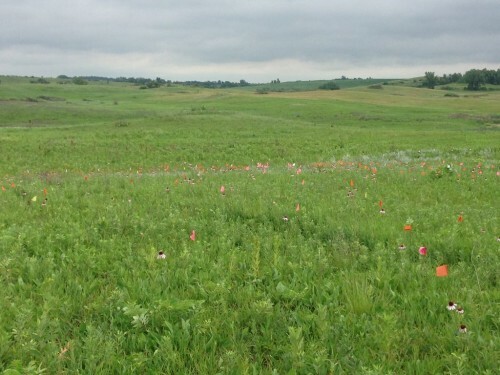 In 2005, Jennifer Ison and Team Echinacea assessed phenology in experimental plot 1 and identified individuals with extreme (i.e. early or late) flowering time (Ison and Wagenius 2014). These extreme individuals served as maternal plants for this experiment; we harvested their achenes, which we then grew into seedlings in the lab. Jennifer collected tissue from the seedlings to identify the pollen donor (i.e. the paternal plant) with microsatellite markers she developed (Ison et al. 2013). In 2006, Jennifer and other team members planted the seedlings (3961 in total) in experimental plot 2. Each year since they began flowering (1 plant flowered in 2009), team members have assessed flowering phenology of the individuals in experimental plot 2. We identify flowering plants early in the season, before they begin shedding pollen, and assess their flowering status regularly throughout the season until they are done flowering (no more than 3 days between observations). In doing so, we collect data on start and end date of flowering for all individual heads in the plot. Preliminary analyses and annual reports are available on the flog.